Hi! I'm just starting with AP, and thinking about getting a mount for a light load: Explore Scientific ED80 (https://www.highpoin...es-es-ed0806-01). I estimate the total load of the scope, camera and other gear to be under 14lb. From the approved budget, I only have ~$800 left for a mount. I know that you shouldn't save on a mount, but in this case it's not an option to spend $1.5k on Atlas. From the reviews that I've read, it seems that EXOS and AVX are pretty much on the same level, AVX being more well known and with a PEC. Explore Scientific very much appeals to me that it has WiFi (I hate hand controls) and a polar scope; also open source is intriguing (I'm a software engineer). Given that EXOS is $200 cheaper, I'm leaning towards it. What will be the wise advice from the community? Edited by orionbay, 23 January 2019 - 06:19 AM. Edited by zxx, 23 January 2019 - 07:53 AM. I'd wait until you could get at least an Orion Sirius or the SkyWatcher equivalent... the mount, until you have a premium mount, is much more important than the camera or scope.. spending $800 now means that you are $800 more away from a decent mount. Watch for a used Sirius or Atlas or SkyWather equivalents. I would add the CEM25 to your list too. https://www.astronom...d.html?___SID=U at $899 it has been a good performer. People are having great success with the CEM25EC but that is 1.9k and way over your budget. Good luck. +1, you should be able to find a used Sirius/ HEQ-5 or Atlas/ EQ-6 for less than $800. Edited by macdonjh, 23 January 2019 - 08:24 AM. If you are considering the AVX, check out the offering from OC Telescope - they replace the RA bearing and perform a "hypertune" on it for you. This helps to ensure that you will be getting one of the "good" AVX models rather than the "bad" ones. I get decent guiding on mine with a similar load and focal length. If you are starting out you can learn all of the other million things that you need to produce decent images. They have it listed, with the upgrade, at $838 right now. Buy used from a seller with a good record here or on the "other site." A used Losamndy G8 should cost $1,000 or less. The G8 is a solid mount. The GM-8 is a good mount, but with Gemini it will be more than $1000, even used. Less than $1000 wit the digital drive (no go-to), though. OK 14lbs now, and what is that exactly? Scope+flattener+DSLR is one thing now, but if 6 months time it means Scope+flattener+Cooled Camera+Guide Scope+ guide camera+Filter wheel+Filters that is a change. So what chance (0) is there of it staying at 14lbs? In AP the set up tends to get bigger/more/heavier. If you have 14lb now I suggest you plan on 30lb later so a mount capable of 40lb at least is probably required, or you buy another mount later on. AP is termed "expensive" for a good reason. I got to 14lb summing the weight of the scope, a guide scope, DSLR and field flattener. I don’t think the cooled ccd will weight more than my DSLR. I don’t think I need a filter wheel. What else can increase the weight? Edited by orionbay, 23 January 2019 - 01:40 PM. I’m curious does anybody take an approach of gradual growth with AP? Like in photography, you usually don’t buy a full frame camera straight away, instead you buy something like Canon 500D and try yourself in this area first, and upgrade later if needed (or don’t ever upgrade if it turns out to be boring). What can be an entry level AP mount that I can sell in a couple of years if I want to upgrade? And if I will end up not that passionate with AP, I could just keep it and do one decent photo a year and be happy. Edited by orionbay, 23 January 2019 - 01:24 PM. The thing with buying used is to get lucky and find it available at the given moment. I can’t find anything available right now, and I don’t want to wait for months to get started. Ideally I want some time to practice before the camping season begins, when I can travel to dark sites. Edited by orionbay, 23 January 2019 - 01:34 PM. Losmandy GM-8 Has only 30lb capacity, how is it better than the mounts I found? I know exactly what you mean ,I started this hobby just under $1500 ,DSLR ,scope ,mount ,guide cam etc ,was more then I wanted to spend . But I can honestly say my cheep CG=4 mount worked great , I have moved up to a CGEM DX but still use the CG-4 with my ED80 and DSLR only with lens . I started with a Celestron CG5 with an 8" no-name reflector and Nikon D3100. I pushed the limits of that mount and my skills until I upgraded to a Celestron CGEM, 8"ATIN and Nikon D5300. Used the latter setup for years until I upgraded to a Vixen SXP and ES 127mm and now an ASI 1600mmp. Everyone's approach is different but I've been able to sell old equipment to fund new equipment. I think you're on the right track, there's some good suggestions here. Generally build quality as it is CNC machined and not cast and machined like all (that I know of) of the sub premium mounts. If you saw one in the flesh and compared it to an AVX, or any other Chinese manufactured mount it would be obvious. While some of the Chinese mounts are pretty good these days many of them simply are not consistent from example to example. Also, if you are in the US, the mounts are made here. This means you can pick up the phone and call and likely be able to speak directly to Scott Losmandy for help if necessary. Yes, even if you bought used. Next they have been made for almost 25 years so parts availability for the foreseeable future is assured. Next, they can be updated to a GM811G (50lb capacity), NO repeat NO other mount can do that! Finally because they have been around a long time there is a terrific support community available. Edited by rkaufmann87, 23 January 2019 - 02:42 PM. There is a robust marketplace for used astro equipment here on CloudyNights and a few other places. Your gear can retain a good deal of its value, with several caveats: It must be kept in very good condition. It must be a brand or model that has generally positive reviews. Unless it is an iconic piece of equipment you can't hang on to it too long as parts become scarce. I have an early 1990's 10" LX200 that needs parts but there are none. It helps if it is not too heavy to ship. I once shipped at 10" Meade 2120 LX5 from California to Brazil - that was nuts! So get what you can afford, keep your wife happy, go through the painstaking work to produce a few decent shots and you will know if the bug has you enough to demand more later. Just to clarify, tell us a little bit more about your background experience. 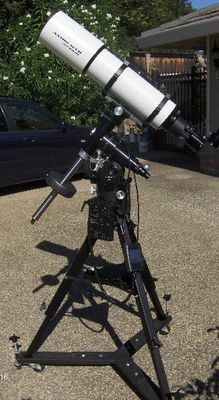 Will this be your first mount and telescope, or have you been observing visually for a while. If you know your way around the sky and a German Equatorial mount, then I agree with the majority opinion, your money would be better spent on a used Sirius or Atlas mount. For astrophotography/astrovideo those are really just great places to start. Been around for a while and good value for their cost. I like Losmandy very much(I have several of their mounts) but I started with an Atlas that I used for 7-8 years or more and learned enough to feel that a step up in performance was warranted. On the other hand, if you are just getting started, an AVX could be a nice introduction to the whole field. There are a lot of basics to learn with respect to using a mount, that you can learn with the AVX. You can probably get a number of years of use before you grow out of it and are ready to graduate to a higher grade mount. No matter WHAT mount you get, I always council PATIENCE. There are A LOT of steps to getting good pictures(and I am still learning most of them:-), and there is ALWAYS something else you can do to make things better. Set small goals each time you go out so you can declare victory. Start imaging with things like the moon and planets, where you are using short exposures so guiding and tracking is not as critical. Then move to bright Deep Sky Objects like the Pleiades and Orion Nebula. Add complexity to your set up step by step. And most of all, remember to have fun! That is interesting - it was listed there on the link I sent earlier at that price. Looked like a great deal to me - I guess it was an error. I will contact Mike over at OC Telescope and see what happened there. They were great to work with when I bought mine. Yep, that is what I did/am doing. It works for me, but it means realizing that if the bug bites you hard, you will end up spending more money eventually. I feel that the investment in my first GEM, the Atlas, has more than paid for itself, even though I have purchased other upgrades(and lateral moves:-). Depends on your own philosophy. Its a hobby, not the Bible:-) Lots of ways to go about it. Just remember to enjoy yourself.